Doc McStuffins Carry-Along Clinic Playset from Flair is a large fold out playset that easily folds away into a carry along box with a handle. It is very eye catching in bold pink and purple colours with a very glittery pink lid! 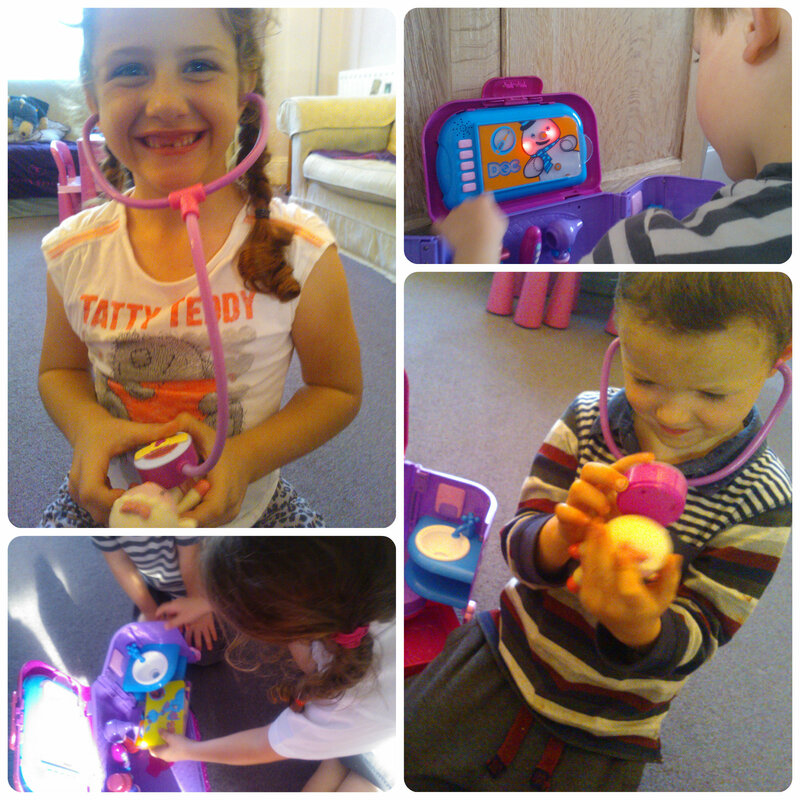 Aimed at children aged 3+ and a toy that is suited to both boys and girls I knew my children would love this as they are keen on any kind of doctor related role play toys. Although the Doc McStuffins Clinic is predominantly feminine colours, 3yr old Mister B wasn’t fazed by this at all and got has had endless play with this. The case unfolds to reveal a clinic set up with a table to put patients on to the left, a Lambie figure to examine which comes sitting on here and to the right is a sink with a turnable tap that clicks around. In the centre are are the doctors equipment, a syringe, a thermometer, otoscope and a stethoscope. The first three instruments handily clip on to the back wall and the stehoscope fits into a slide out drawer underneath. You do have to balance the doors not too wide apart otherwise the unit tends to tip backwards, alternatively I just propped it up against a cupboard to save any frustrations that the children had with it. Also on the inside of the is an interactive panel with four different character panels that slide in. The panel can be used as it sits on the lid or taken off and held in the child’s hands or on the floor. There are buttons to press and the panels light up showing the characters ailment and suggests which medical instrument to use to help them get better. Mister B was particularly fascinated by this especially the song from the tv show which he sings along to and now knows every word to. He can’t help but sing with a huge grin on his face and with the accent! All all the parts are made of plastic, they all feel strong and well made which is good as I think they will get lots of play value so they need to be durable. I like the way that the playset folds up with all the pieces contained inside. The carry handle is nice so that the child can carry it along to any medical emergency they come across. My two have loved playing with this although not without a little bickering as to who is going to have which instrument, but they did learn to share and played well together. There are endless possiblities for play whether they gave medical attention to Lambie, Miss M’s dolls or even giving each other a medical examination! 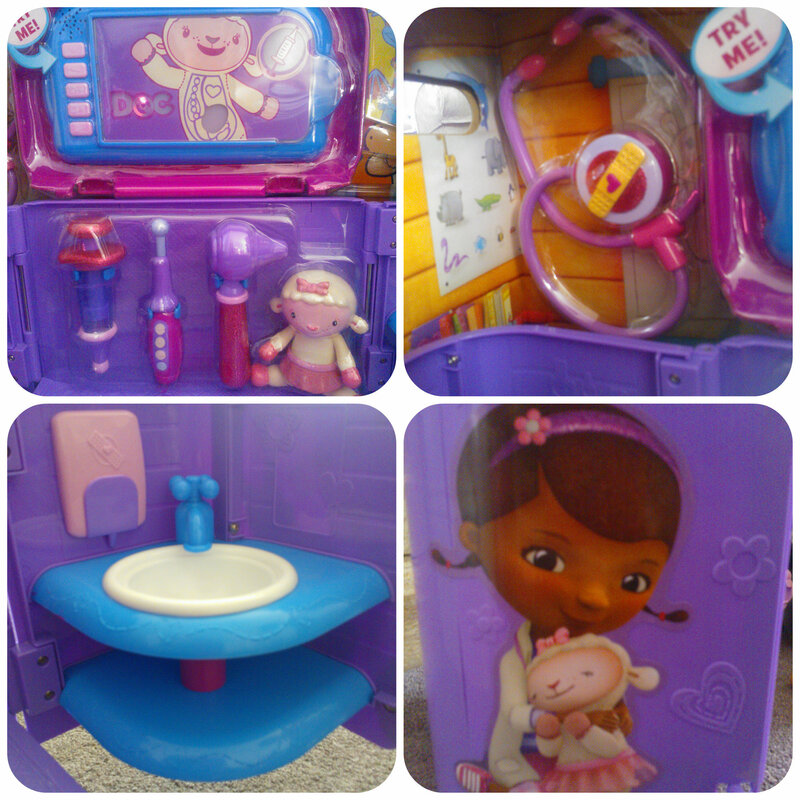 The Doc McStuffins Clinic Playset is definitely an impressive size and a good, durable build. There’s various pieces to keep the children entertained and I’m sure this will be a must have Christmas present for some, with it’s glittery lid and bright pink and purple features, I’m sure there’s many little girls out there that would love this! All reviews are my own and my family’s opinions and we received the play set in order to write the review. 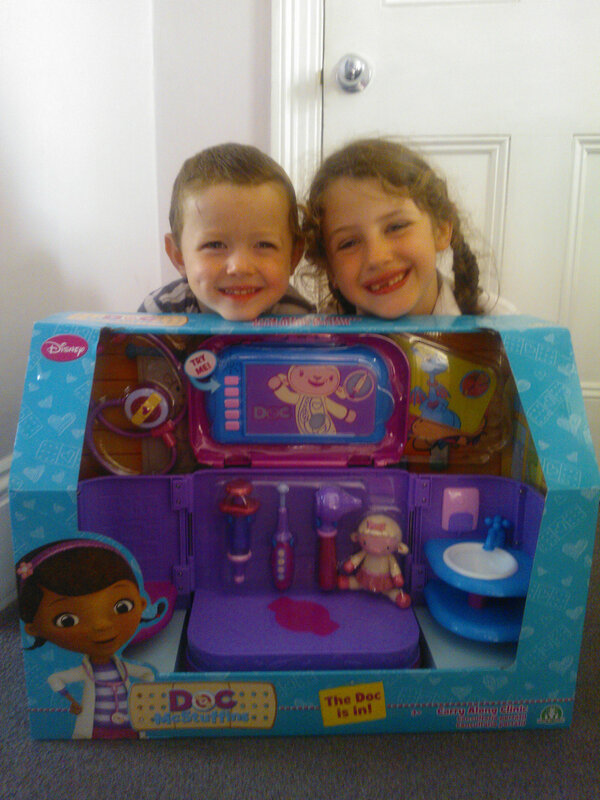 This entry was posted in Reviews and tagged carry along, clinic, Doc Mcstuffins, interactive, lambie by Fiona Martin. Bookmark the permalink. These were awesome! My daughter would love them! Look great! Looks like your two have had a lot of fun with this! This looks fun, I am sure my little mouse would love it! One for Christmas I think! This play set looks awesome. My niece loves these kind of gifts.